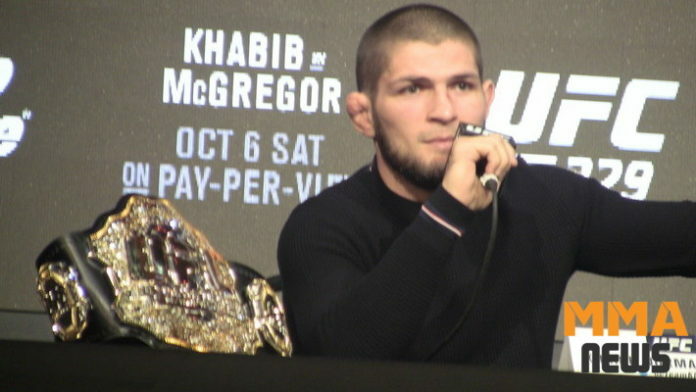 Khabib Nurmagomedov isn’t a fan of whiskey and he doesn’t believe it’ll help Conor McGregor on Oct. 6. Nurmagomedov and McGregor will collide in the main event of UFC 229. The event will be held inside the T-Mobile Arena in Las Vegas, Nevada. It’ll be McGregor’s first professional mixed martial arts bout since Nov. 2016. Meanwhile, this will be Nurmagomedov’s first UFC lightweight title defense. UFC 229 will also feature a 155-pound scrap between Tony Ferguson and Anthony Pettis. Many view this bout as an insurance measure. If Nurmagomedov or McGregor were to pull out, then either Ferguson or Pettis can step up to save the main event. If the main event and co-headliner remains injury or illness-free, then the card has two lightweight bouts that are almost guaranteed to deliver. Do you think Conor McGregor is losing his way or is he just hyping up the UFC 229 main event while promoting his whiskey?